Do you want a Gear S2 original or a Gear S2 Classic? This is the question that Samsung smartwatch fans are asking themselves this year, as the Korean manufacturer unveiled its newest take on smartwatches in an arena that is quickly becoming a crowded market when you add fitness bands and activity trackers alongside of Google’s Android Wear and Apple’s WatchOS platforms. What is the benefit of the Gear S2 Experience app? Let’s say that you’re wanting to try on the Gear S2, so you visit your local carrier only to discover that the carrier is out of stock. In this case, you wouldn’t have a live watch to try on, but you could at least find out what look it will give your wrist. Additionally, you may have heard about the Gear S2 smartwatch but may not be familiar with all of the new features. 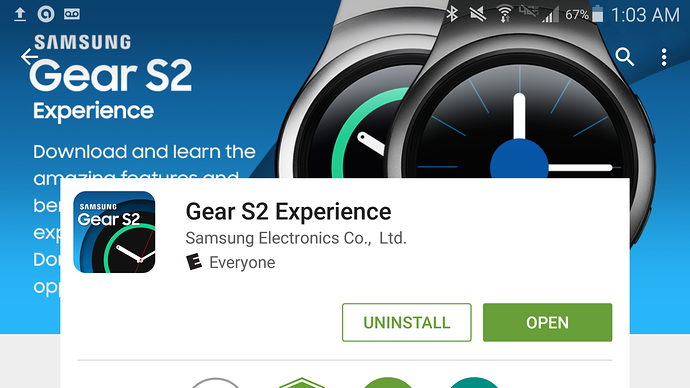 Downloading the Gear S2 Experience app would help bring you up to speed with all the smartwatch offers before you see it in person. Once inside the Gear S2 Experience app, you’re given a tour of four features: 1) Aesthetic and Elegant Design, 2) Intuitive Experience, 3) Healthier Lifestyle, and 4) Convenience & More. In the Aesthetic and Elegant Design category, for example, you’ll get to choose whether you want the basic or the classic model. The Intuitive Experience will let you virtually turn the star feature of the Gear S2, the rotating bezel, to send text messages and navigate the user interface. Healthier Lifestyle allows you to track your heart rate, your workouts, and to keep you moving when you’ve been inactive for some time. 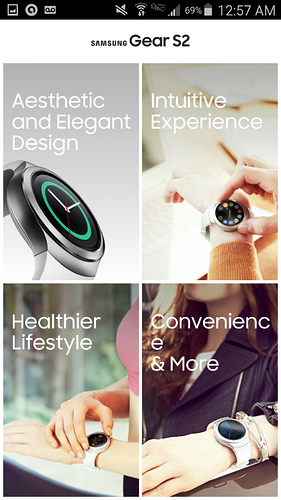 Convenience & More gives you access to notifications, Samsung Pay, and other features. Finally, there is a “try on” blue button at the bottom of all these components of the Gear S2 Experience app, allowing you a virtual dressing room in which to try out the app. When you press “try on,” you’ll be taken to a camera setup that allows you to try on the watch in your current room. The fun part of the virtual dressing room is that you have to work at turning your wrist at just the right angle to try on the watch. The Gear S2 Experience app is available at the Google Play Store for Android devices running Android 4.1 Jelly Bean and up, with 1GB of RAM or higher, and running an HD resolution of 720p or higher (1080p, 1440p, etc.). If you want to order your Gear S2 online without the actual carrier hassle, it’s worth the download.